Our wagon bumps up and down over seldom traveled roads as I look into a bright November sky. I tally the months since they took me from the river bank calculating four and a half. Little Mila and Avon play with a single tin soldier on the floor, as Angelina continues to knit. We travel now to Essex to meet Matruska. I am apprehensive, tossing in my sleep last night, unprepared to hear what she might discover. What if she can tell me where I belong? What then? This family has become my heart. Can I rip myself away for an unknown future? I clutch my gift which is simply painted, but improved by borrowed strokes of Edwin’s mastery. The touch of it brings the warmth of his parting embrace and remembered words of encouragement. He was distracted when we left, busying himself with packing and shipped the portrait he completed of me to an agent in France. I am edgy and tense as we stop near a thicket, an uneasy feeling pulsing in my belly. Angelina sees the fear in my eyes and covers my trembling hand. I leave my walking stick in the wagon, needing it less and less, and descend the stairs, stroking the horse’s neck as I pass. “See you soon girl,” I say, stalling for time. She turns to me, hoping for a piece of carrot, but I have nothing. The wagon pulls away as I stand frozen and conflicted at Matruska’s door. I do not announce myself or knock, having an overwhelming sense of crossing a threshold that may change my life. The smell of Irish soda bread wafts from a wood burning stove as Matruska places her buckets in a cool corner. Herbs hang overhead, creating a ceiling of foliage which permeates her home with scent. Matruska is smaller than I imagined with hair more white than grey, and a sinewy body I would have judged frail, if I’d not seen her hoisting potatoes like buckets of dust. A loom sits in the corner near embers of fire, a woolen cloth waiting on the warp. I untie the string that holds brown paper against the painting, letting it fall away. 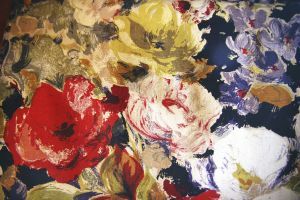 My floral canvas is revealed. She looks pleased as she cleans her hands to reach for it, but as her fingers touch the frame, she stops, alarmed, flailing her arms and pulling brusquely away. Matruska sits down looking ashen and electrified, the fallen painting askew on the floor. She is silent, staring at the canvas and then at me. Aah, the plot thickens! Loving every twist and turn, my friend! Feel like Maya is someone I know and love!